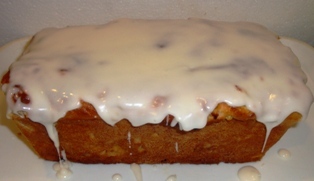 How to Make "Ellijay Apple Bread" at Home! OK, so no one in Ellijay would spill the beans (or apples...) and give me their recipe for Ellijay apple bread. No matter.. as a former chef and chemical / environmental engineer (at different times... I didn't serve aliphatic hydrocarbons to customers) I was determined to reverse-engineer the recipe. And I have! After tasting and testing a dozen loaves of apple bread last weekend in Ellijay, I discovered that there are two main types: yeast and quick, The yeast type uses yeast to raise the dough; the quick type uses baking powder. The consensus among my group of tasters is that the yeast variety is substantially better! The quick types are definitely faster and easier to make, but most people do prefer the yeast types. It's up to you to choose! Plus, I've eliminated the trans-fats and much of the fat I saw listed on the ingredients on the packages of Ellijay Apple breads that I tasted, so this version ought to be healthier than anything you can buy! Let me know which you like and any tips and tricks you learn and I'll share them here! I keep tweaking and improving the recipe each time I make, so it always gets a little better. But the version below is better than any I've had in Ellijay! 1/2 cup of sugar OR 1/2 cup of of honey or agave (for sweetness AND the yeast needs it!) I presume that diabetics could make a solution of an equvalent amount of Splenda or Stevia with a 1/2 cup of water, but I have not tried that. 7 to 8 cups of all-purpose flour or bread flour (but NOT self-rising flour!) White whole wheat flour works, and I would guess whole wheat does, too. I haven't yet tried a gluten-free flour like oat flour or rice flour. 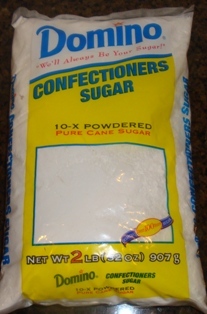 1 cup powdered sugar (aka, confectioner's sugar), Again, diabetics might want to skip ther icing or make a sugar-free version with milk and vannila extract. 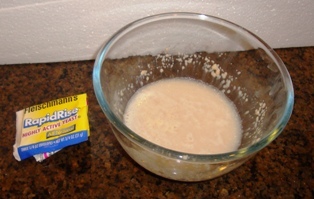 Dissolve the yeast in the 1/2 cup of warm water and set it aside in a warm place (room temperature is fine, unless your room is below 60 F (15 C) ), to activate the yeast. Combine the salt, cinnamon, sugar (or honey; I prefer honey) shortening and hot water in a large bowl and mix them well with a large spoon and/or your hands. 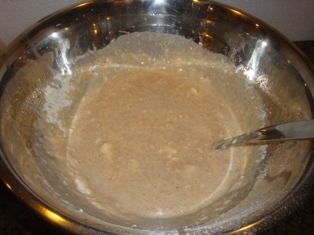 Stir in the applesauce, next the powdered milk, then the yeast/water mixture. It will obviously be pretty soupy! 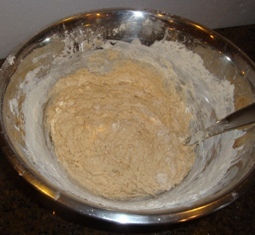 Slowly add the flour, about 1 cup at a time, pausing to mix well, until it forms a stiff dough. It will start out wet, then get sticky. You want to add just enough flour to get barely get to the "sticky" stage. It will probably take about 6.5 to 7 cups of flour. Peel and core 2 medium to large apples. 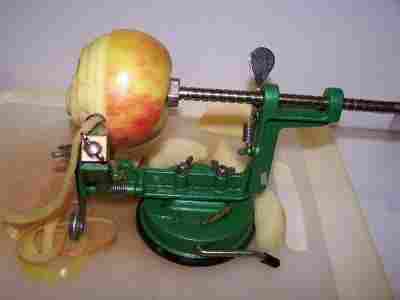 The fastest way to peel the apples is one of these peelers! If you use the blade up (on the end of it), it also slices and cores the apples, in addition to peeling! With firm apples, it takes about 20 seconds per apple. These apple peelers don't work well on soft, mushy apples or apples with soft spots on them. 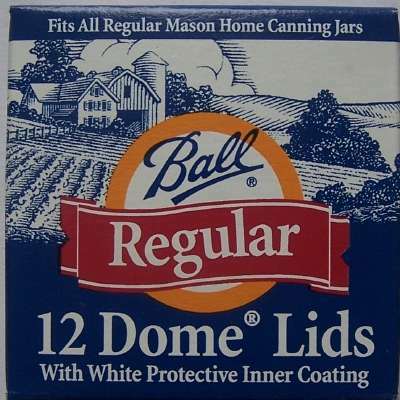 In that case your stuck with a hand peeler! I like pieces that are about 1/8 inch thick and 1/4 to 1/2 inch across. 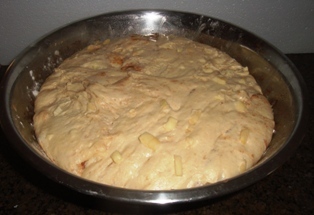 Mix the apple pieces into the dough. 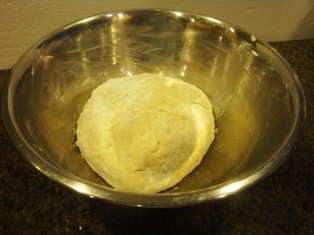 Put the dough in a large bowl covered with cling film (plastic wrap) and set it in a warm place (80 F to 110 F) to rise. I turn the oven on for 5 minutes at 200 F to get it warm, then turn it off and put the bowl of dough in there. When the dough has rise to about double in size, uncover the dough and with your fists, punch it down. You can shape the dough into a likeness of your mother-in-law before you punch it down, but that is strictly optional. Cover the bowl again and put it back in the warm place (80 F to 110 F) to rise again, until it has doubled in size. While the dough is rising, take 2 standard bread loaf pans (9" x 5") and lightly grease (using shortening or butter) and then "flour" (put 3 tablespoons of lour in and shake it around, then dump the excess out) them. 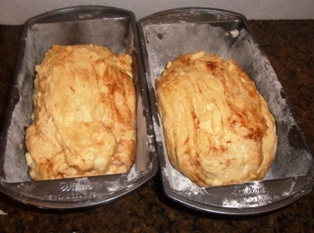 Put the two loaves back in the warm place (80 F to 110 F) to rise until they are just 1/2 inch to 1 inch above the top of the pans. This usually takes about 30 minutes. If you have two ovens, get the other oven heating to 350 F.
Do this while the loaves are rising. This is easy! 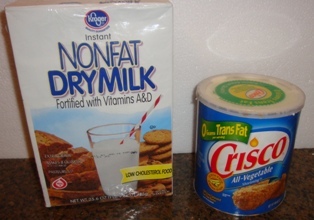 Just put 1 cup of powdered sugar in a bowl, add 1/4 teaspoon vanilla extract and then 1 tablespoon milk. If it it still too thick, add just a teaspoon of milk. It takes very little milk to liquefy the sugar! Some people like to put thinly sliced peices of apples on top of the loaves just before baking them. Bake in the 350 F oven for about 25 to 35 minutes. The crust should be golden brown and a thermometer inserted should read between 185 F and 200 F. A convection oven is ideal for bread since there are no hot spots, otherwise put it in the center of the oven and check on it so you can pull it out when it hits a nice golden brown. 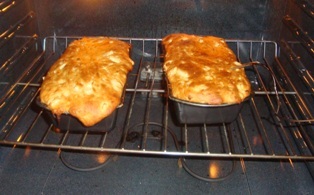 Turn the loaf out of the pan and rest it on its side on a cooling rack for 45 minutes to 1 hour. 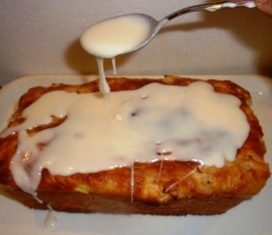 While it is cooling you can spoon the icing over the top! Take 2 standard bread loaf pans (9" x 5") and lightly grease (using shortening or butter) and then "flour" (put 3 tablespoons of lour in and shake it around, then dump the excess out) them. 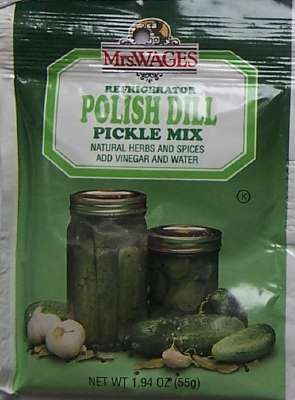 with a wire whisk and set them aside. In a large bowl, blend the sugar and butter together to make a smooth creamy texture. Stir in the 2 eggs and then 1 teaspoon of vanilla. 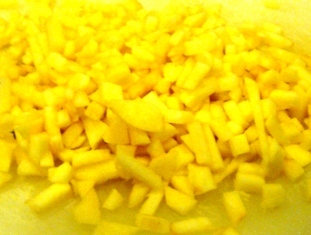 Add diced apples and mix. Add dry ingredients from step 3 to the wet ingredients from step 6 and mix until it is just evenly moistened. Pour into the pans prepared in step 2. Cool in the pans for 10 minutes, then turn them upside down onto wire rack to complete cooling. 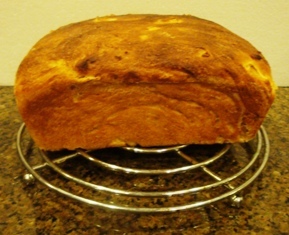 Here's another variation of the baking powder apple bread recipe above! It's a bit drier and more crumbly that the recipe above. 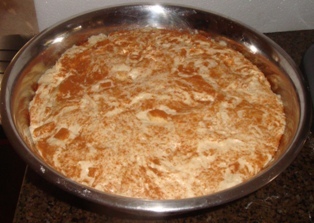 Combine eggs, sugar, oil and vanilla until well mixed. Combine flour, baking soda and cinnamon; stir into egg mixture. Fold in the chopped apples and pecans. 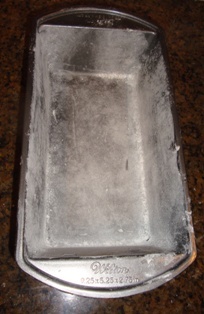 Divide the dough equally between 2 greased and floured 9" x 5" loaf pans. A visitor writes on September 22, 2013: "I wanted to thank you so much for creating this page! I've never seen so many amazing recipes in one place, and you clearly explain all the steps and possible changes that can be made. I live in Kennesaw, GA and recently went up to Elijay, GA with my girlfriend to get the first apples of the season. Picked up about 15lbs of apples and was looking for recipes. 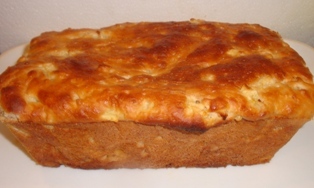 I had tried some apple bread up there, but couldn't find any good recipes for it online. Then I stumbled across your site and used this recipe. The bread turned out DELICIOUS. Thank you again for having this site!"